April’s new home sales figures shined a light on a long-growing problem in the housing market: homebuilders are not breaking ground on the kind of houses that will alleviate supply-side pressure. Last month, the median new home price was $309,200, down 4 percent from the same period last year. While the decline in prices could point towards a shift in developers’ focus, more entry-level homes will need to be constructed to meet the demand for first-time buyers. During the housing boom in the middle of the last decade, new home prices were just 6 percent higher than existing home prices. In April, however, new home prices were 26 percent higher than the median existing home price, according to the National Association of Realtors. A spread of $64,400 between new and existing median prices is too much for most buyers to overcome, even with interest rates hovering near 4 percent. Developers are lamenting that there aren’t enough workers to ramp up construction, but the focus on construction is the real reason for the low volume in new home sales. 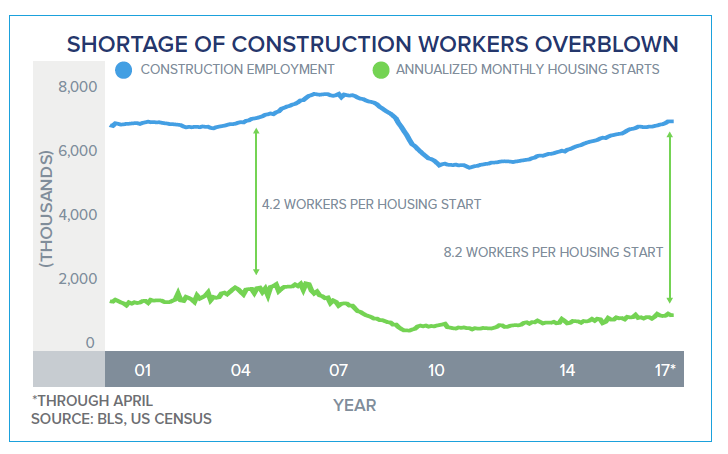 Currently, there are 5.9 construction workers for each single-family and multifamily housing unit that breaks ground, which is above levels seen during the boom in the past decade. For every single family home, there are 8.2 workers per housing start, well above the levels seen in 2004 and 2005. However, high rents and elevated land costs are encouraging homebuilders to focus on multifamily buildings. Since 2011, only 67 percent of housing starts have been single-family homes, compared to 80 percent during the previous 20 years. As developers focus on apartments, homebuyers hoping to jump into the ownership pool are left with very few options.